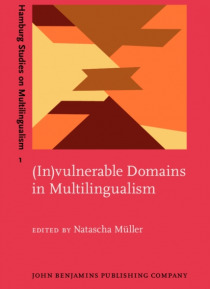 The focus of this collection of essays is on the acquisition of so called vulnerable and invulnerable grammatical domains in multilingualism. Language acquisition is studied from a comparative perspective, mostly in the framework of generative grammar. Different types of multilingualism are compared, the existence of multiple grammars in L1 acquisition, simultaneous L2 acquisition (balanced and un… balanced bilingualism) and successive L2 acquisition (child and adult L2 acquisition). Evidence from the language pairs French-German, Italian-Swedish, Spanish-English, Spanish-German, Spanish-Basque, Portuguese-Japanese-English, Portuguese-German, English-German, Turkish-German is brought to bear on grammatical issues pertaining to the morphology and syntax of the noun phrase, pronoun use and the null-subject property, clause structure, verb position, non-finite clauses, agreement at the clause level, and on issues like code mixing and language dominance.